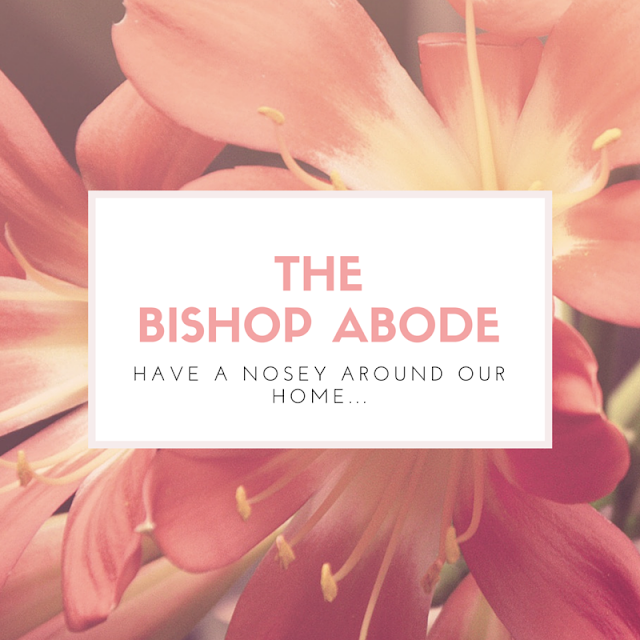 If you're anywhere as near as nosey as I am, you'll love nothing more than a good gander at other people's houses. I adore interiors and love to see the choices others make within their homes. I appreciate all sorts of styles/themes and colour schemes from the über-modern minimalism and monochrome, to shabby chic and more vintage inspired looks. 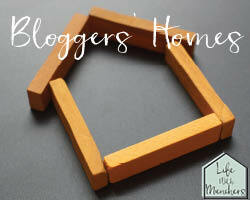 I regularly find myself lost in other bloggers' home posts, interior Pinterest boards and the such. 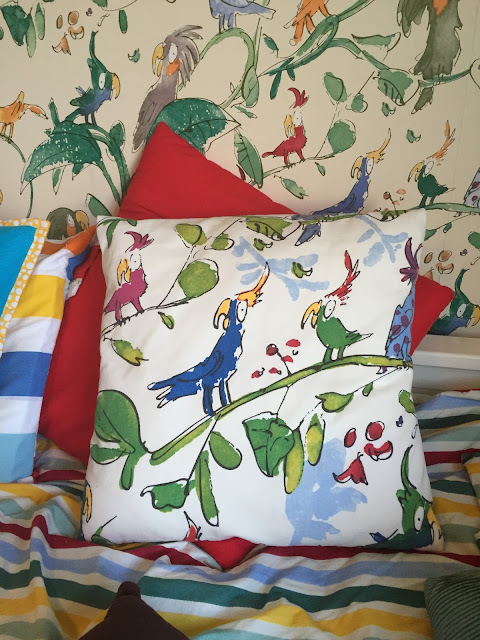 I spend longer than I'd care to admit 'virtual window shopping' online for homewares and furniture, and adore redecorating rooms in our own home, or giving them a little spruce up when the budget won't stretch. A few months ago I shared Bert's 'Big Boy Room' with you - and although we didn't have the budget to go the whole hog and properly re-decorate what is/was our 'spare room', we gave it a new lease of life with some cool accessories etc. 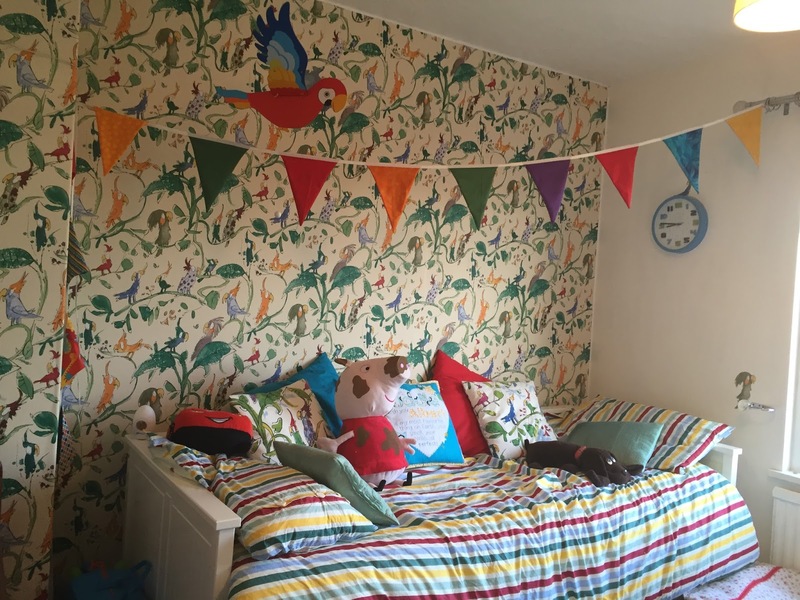 It is all ready for him to move in to and we hope he'll be tucked up safe in his big boy bed before his baby sister joins us in the summer. So, our house is a three double-bedroomed semi in a quiet close in Bedford, Bedfordshire and we've lived here for coming up five years. Downstairs we have an entrance hall with cloakroom/toilet, which leads into a living room, we have a large kitchen leading into a separate dining room to one end, and a small office leading off of that. We have a garden with large patio, lawn, pear tree and brick built outhouse/shed. Upstairs we have three double bedrooms and a large family bathroom with separate bath and shower. Plenty of space for our little family of 3 (soon to be 4!). The first room I want to share with you in this series of posts is the Nursery. It's still being used by Bert at the moment, but once he's moved over to his big boy room it will be all ready for baby girl Bishop when she arrives in the summer. 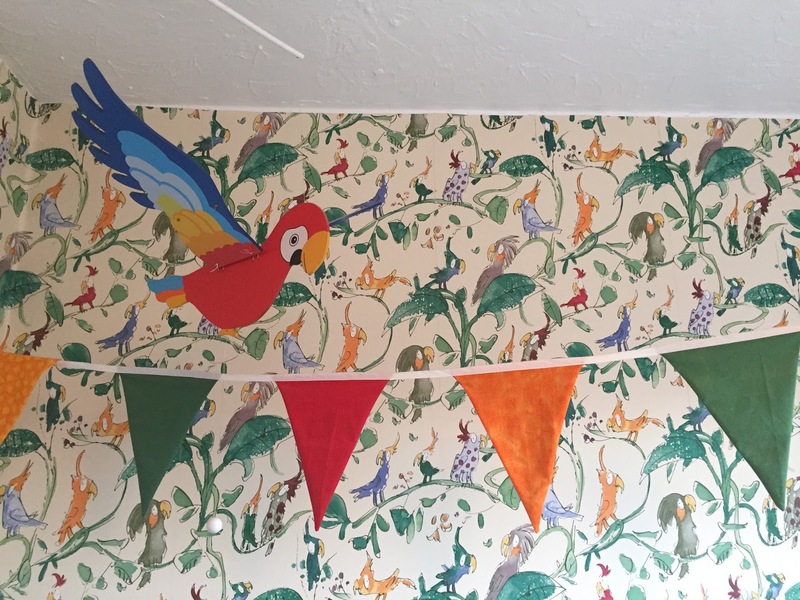 We redecorated this room completely shortly before we had Bert and tried to make sure it was gender-neutral, hoping that we'd go on to have other children after Bert. Here we are 2.5 years later awaiting the arrival of baby number two, and I'm pleased to say that I still love this room just as much as I did when we first decorated it. We decided on lovely bright colours and a beautiful feature wallpaper from Osborne and Little by Quentin Blake (my favourite illustrator) - the paper is called 'Cockatoos' based on Blake's famous book of the same name, and I totally adore it! Isn't it fun? When purchasing the paper I also bought some 'Cockatoos' fabric to sew some cushions to match, which now live on the daybed. 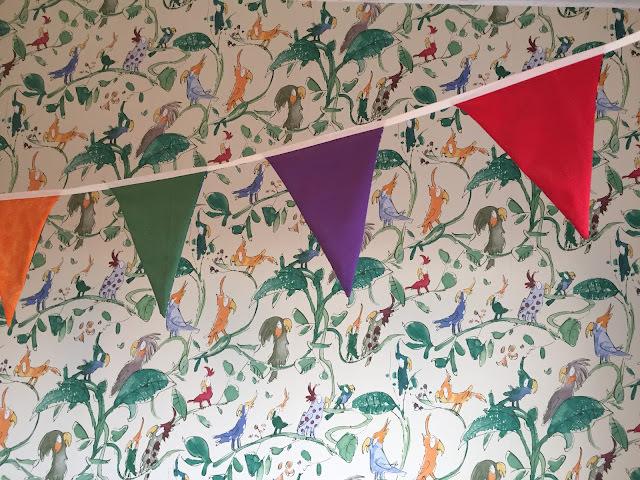 We then went on to accessorise the room with multi-coloured marvellousness - like the fab striped bed cover set from Emma Bridgewater (another favourite of mine), bright bunting, and a hanging/flying wooden parrot. 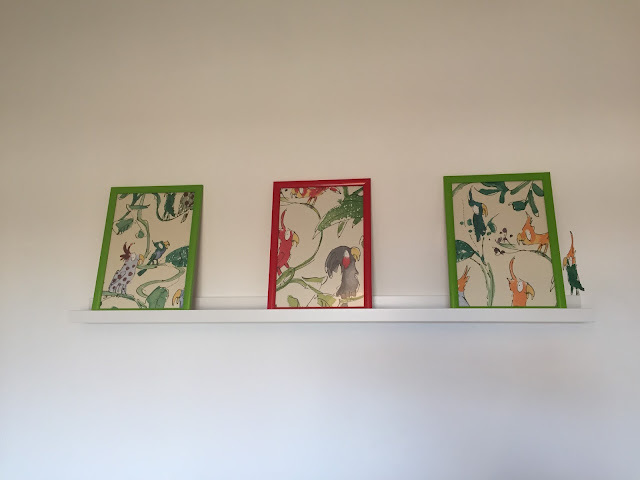 As well as using fabric to accessorise the room, I also used offcuts from the wallpaper to frame some A4 sized sections and sit them on a floating shelf from IKEA to brighten up the non-wallpapered plain white walls. 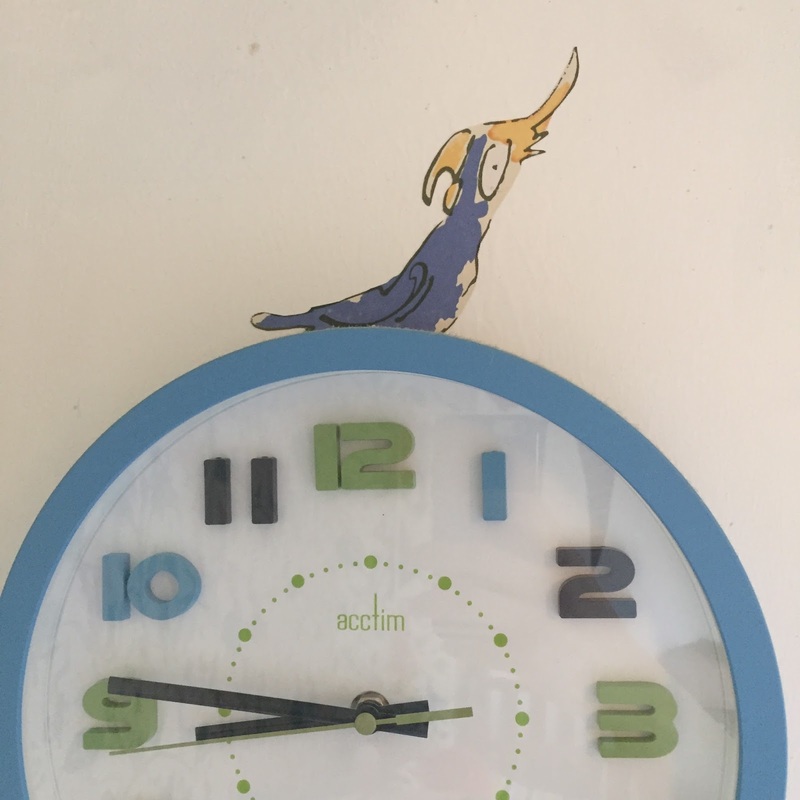 I also painstakingly cut around individual cockatoos from wallpaper offcuts and pasted them cheekily around the nursery - hiding on shelves, skirting boards, light switches, above the clock etc - just like in the storybook I wanted to give the effect that the cockatoos had flown right off the wallpaper and were hiding in and around the nursery. We added more floating shelves on another of the plain white walls to house Bert's cuddly toy collection, which hides behind our beloved dolls house. The dolls house sits atop an extra large white chest of drawers. 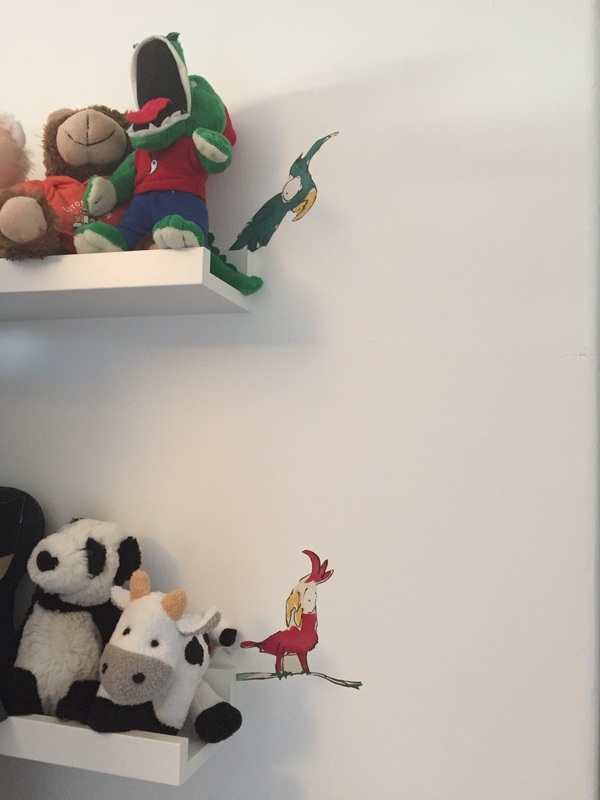 Cuddly toy shelves and more pesky cockatoos! 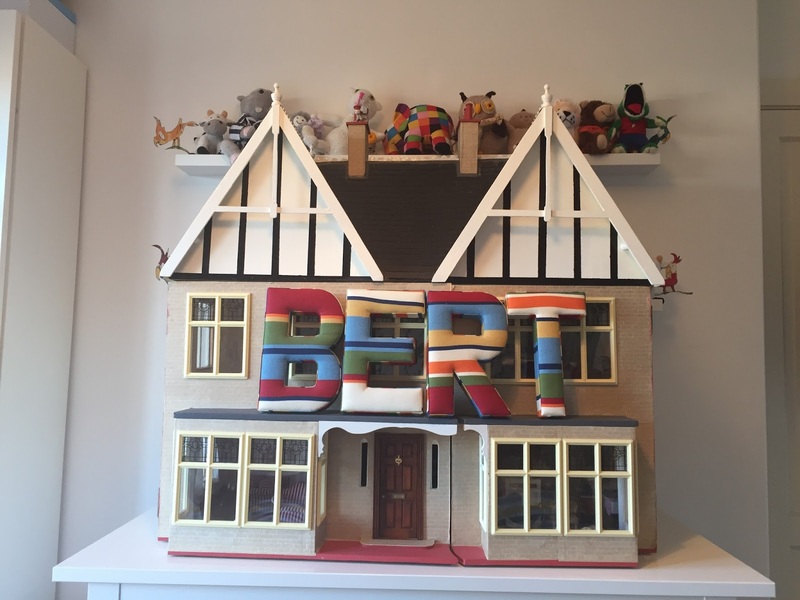 The dolls house and gorgeous 'BERT' fabric covered letters. We wanted the nursery space to be multi-functioning - obviously it needed a cot and storage, but we also wanted it to house a day bed which could sleep adults too if necessary: this is particularly handy for sleepy mums during night feeds, and also for guests as we often have 2+ guests staying with us as most of my family live in Surrey and regularly come up to visit, so one spare bed really isn't enough for us when the hoards arrive! 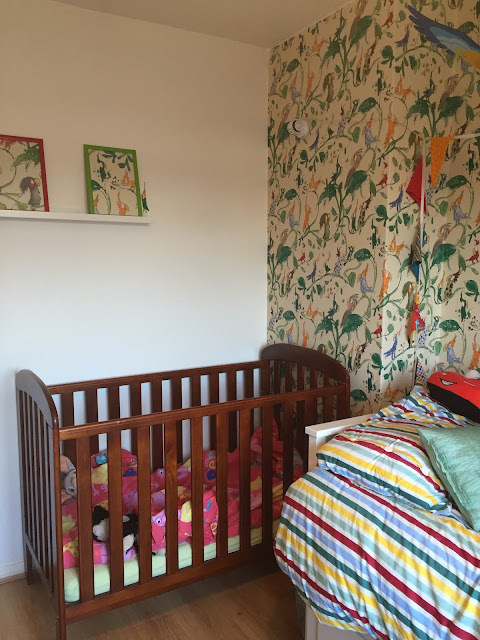 We went with an IKEA daybed which pulls out to a full kingsize bed, which is the perfect addition to our nursery space. Bert's cot - complete with his pink Peppa Pig bedding that he chose for himself! :-) It is SO weird to think that there'll be a baby girl in there soon!! Who wouldn't feel happy in a room like this? I'm so excited for what the Spring and Summer will bring - I find Spring such a joyful, inspiring and exciting time - I'm usually my most motivated during this season, which is a good-job as I'll be in full-on nesting mode before long I'm sure. Spring cleaning, baby clothes sorting, and generally sprucing up our home in time for our new little bundle: fun times! 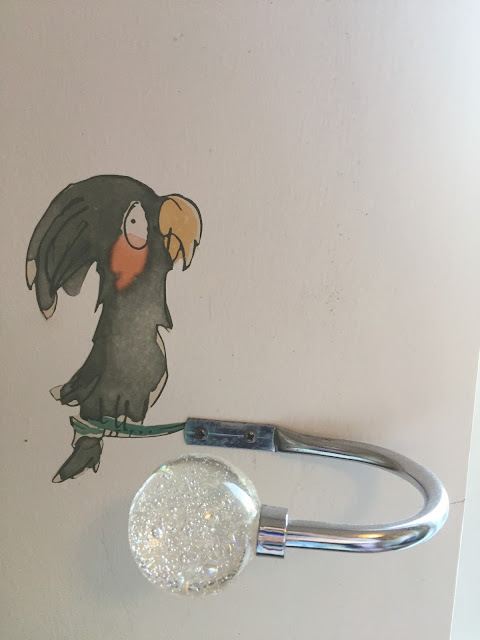 Mr Parrot adds some extra charm, don't you think? Watch this space interiors lovers! I'm just like you, I love a good old nose around someone else's house. I absolutely love the wallpaper you've used here! 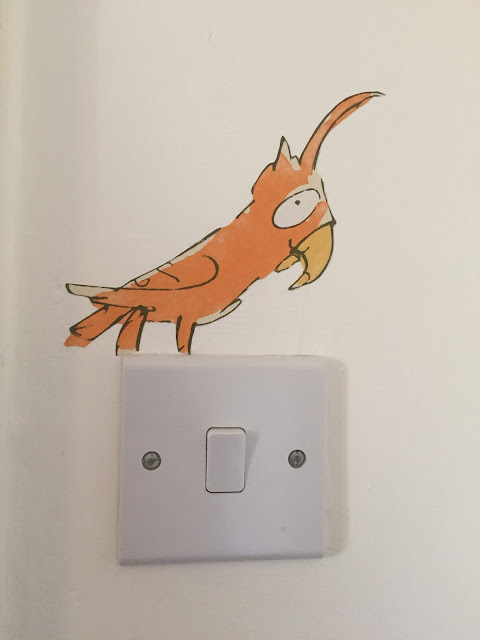 And the way you've used it around the room is great, especially the little guy on the light switch. Love the flappy parrot too. And how exciting that it'll be getting a brand new resident! I love the parrott. I love nothing better than nosing around peoples homes hence why I starts Corners of my Home couple years ago.